Includes insider tips from the perspective of the world's leading Web developers. Focuses on project management as it relates to e-commerce. Teaches you to organize and put together a team, develop goals, manage schedules and budgets, overcome pitfalls, maintain, evaluate and evolve a commercial Web presence. 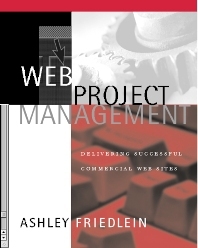 Includes an introduction to the key principles of Web project management and a case study of the Channel 5 Web site-a popular project managed by the author. Provides templates, via a companion Web site, that you can use to develop your own project documentation, a discussion forum, links to related sites, a glossary of terms, a database of useful white papers, and an Internet knowledge quiz. Project Managers, Producers, Web Managers, Webmasters, Production Managers, Developers, Designers. Preface. The World of the Web Project Manager: 1 Setting the Scene. 1.1 Project Management Principles 1.1.1 The Force of Change on the Web 1.1.2 Parallel Development on Web Projects 1.1.3 Broader Skill Set Needed for Web Work 1.2 Roles and Responsibilities of the Web Project Manager 1.2.1 Knowledge 1.2.2 Communications 1.2.3 Documentation 1.2.4 Quality Control 1.2.5 Development 1.3 Where Do the Project Manager's Responsibilities Begin and End? 1.4 Attributes of a Good Project Manager 1.5 The Rewards of Being a Web Project Manager 1.6 The Composition of a Web Development Team 1.6.1 The Evolution of Web Development Teams 1.6.2 The Necessary Skills Within a Web Development Team 1.6.3 Team Structure 1.6.4 Roles and Responsibilities 1.7 Once upon a Time . . . 1.8 Summary Method: 2 A Web Project Method. 2.1 The Importance of Having a Method 2.2 Different Methods for Different Purposes 2.3 Summary 3 The Project Road Map. 3.1 Project Phases and Work Stages 3.1.1 Phase 1 Overview: Preproduction 3.1.2 Phase 2 Overview: Production 3.1.3 Phase 3 Overview: Maintenance 3.1.4 Phase 4 Overview: Evaluation 3.2 Individual Projects as Part of a "Virtuous" Development Spiral 3.3 Team Workflow Throughout Project Work Stages 3.4 Project Manager Competencies and Tasks Mapped to Work Stages 3.5 Summary 4 Work Stage 1: Project Clarification. 4.1 Where the Project Manager Fits In 4.2 The Importance of Getting a High-Level Project Sponsor 4.3 The Opportunities at This Stage 4.4 Discover, Refine, Define 4.4.1 Discover 4.4.2 Refine 4.4.3 Define 4.5 Commercial Requirements 4.6 Creative Requirements 4.7 Technical Requirements 4.8 Content Requirements 4.9 The Project Brief 4.10 Budgets, Schedules, and Resources 4.11 Summary 5 Work Stage 2: Solution Definition. 5.1 The Project Manager's Role 5.1.1 Bring In the Consultants 5.1.2 How the Bidding Process Fits into the Preproduction Phase 5.1.3 Defining How You Will Run the Project 5.1.4 An Opportunity to Learn 5.2 Defining a Web Strategy 5.2.1 Review of Strategic Objectives 5.2.2 Development of a Business Case 5.2.3 Development of a Business Model 5.2.4 Development of the Web Proposition 5.2.5 Implementation and Organizational Requirements 5.2.6 A Web Strategy Example 5.3 The Creative Solution 5.3.1 The Creative Environment 5.3.2 Brainstorming 5.3.3 Brand Development 5.3.4 The Look and Feel 5.3.5 The Tone and Editorial Voice 5.4 The Technical Solution 5.4.1 Keeping Abreast of Technical Advances 5.4.2 The Responsibilities of the Technical Solution Team 5.5 The Content Solution 5.5.1 Working with an External Content Provider 5.5.2 The Importance of the Format of Content 5.5.3 Ensure Content Is Ready for Web Use 5.5.4 Start Content Creation and Preparation Early 5.5.5 Defining Editorial Procedures and Update Mechanisms 5.6 The Project Management Solution 5.6.1 Start to Involve the Implementation Team 5.6.2 Set Up Regular Meetings 5.6.3 Team Agreements, Main Points of Contact, Reporting, and Sign-Off 5.6.4 Set Up Working Environment 5.6.5 Terms and Conditions of Work 5.6.6 Fallback and Recovery Plans 5.6.7 Resourcing 5.7 Summary 6 Work Stage 3: Project Specification . 6.1 The Importance of the Project Specification 6.1.1 The Importance to the Team 6.1.2 The Work Involved 6.1.3 The Cost Involved 6.1.4 Contracts 6.2 The Content of the Project Specification Document 6.2.1 Version Control 6.2.2 Distribution List 6.2.3 Contents 6.2.4 Introduction 6.2.5 Project Objectives 6.2.6 Success Criteria 6.2.7 The Site Map 6.2.8 The Functional Specification 6.2.9 The Technical Specification 6.2.10 The Content Plan 6.2.11 Marketing 6.2.12 QA and Testing 6.2.13 Updates and Maintenance 6.2.14 Critical Path 6.2.15 Budget 6.2.16 Appendix 6.3 Summary 7 Work Stage 4: Content . 7.1 Introduction to the Content Work Stage 7.2 Responsibilities of the Project Manager 7.3 Sourcing Content 7.3.1 Content Syndication and Creation 7.3.2 Free Content and Functionality 7.3.3 Content Repurposing 7.3.4 Stock and Library Content 7.4 Managing Content Providers 7.5 Content Formats 7.5.1 Considerations for Text 7.5.2 Considerations for Imagery 7.5.3 Considerations for Audio 7.5.4 Considerations for Video 7.6 Content Delivery 7.6.1 Mail and Email 7.6.2 ISDN 7.6.3 HTTP and FTP 7.6.4 Zipping and Stuffing 7.7 Asset Tracking and Management 7.7.1 File Structures 7.7.2 Databases 7.7.3 Content Tracking 7.7.4 Viruses 7.7.5 Back Up 7.8 Managing Copywriters 7.8.1 The Challenges the Copywriter Faces 7.8.2 How to Help the Copywriter 7.8.3 Presenting Copy Work to the Client 7.8.4 Constructive Criticism 7.9 Storyboarding 7.9.1 What Storyboards Should Contain 7.9.2 Methods of Storyboarding 7.10 Content Management Systems 7.10.1 Separation of Content and Presentation 7.10.2 Customer Relationship Management 7.10.3 Considerations Surrounding CMS 7.11 Summary 8 Work Stage 5: Design and Construction. 8.1 Forward Planning 8.1.1 Things to Prioritize in Forward Planning 8.1.2 Setting Up the Server 8.2 Meetings 8.2.1 Importance of Meetings 8.2.2 A Format for Effective Meetings 8.2.3 Kick-Off Meetings 8.3 Briefing Your Team 8.3.1 When to Prepare Briefs 8.3.2 Briefing Meetings 8.3.3 Scope of the Brief 8.3.4 Contents of the Brief 8.3.5 Briefing on Changes 8.4 Working Environment 8.4.1 Location of the Team 8.4.2 Tools and Materials 8.4.3 Management and Reporting Structures 8.4.4 The Development Environment 8.5 Team Management 8.5.1 Tell Them About You 8.5.2 Understand Their Jobs 8.5.3 Involvement in Client Meetings 8.5.4 Workflow 8.5.5 Resolving Issues 8.5.6 Staying in Touch 8.6 Work in Progress 8.6.1 Reporting on WIP 8.6.2 Showing WIP 8.7 Sign-Off 8.7.1 The Dangers in Omitting Sign-Off 8.7.2 Approaches to Getting Sign-Off 8.8 Change Control 8.8.1 Recognizing When a Change Matters 8.8.2 Change Request Forms 8.8.3 Managing the Client's Expectations 8.9 Documentation 8.10 Prototyping 8.10.1 Market Research 8.10.2 Approaches to Prototyping 8.10.3 Forms of Prototyping 8.11 Troubleshooting 8.11.1 Catch Problems Before They Become Problems 8.11.2 Turn a Problem to Your Favor 8.11.3 Share the Problem 8.11.4 Why Is the Client Having a Problem That You Are Not? 8.12 Summary 9 Work Stage 6: Testing, Launch, and Handover. 9.1 Testing 9.1.1 Selling the Importance of Testing 9.1.2 Types of Testing 9.2 Launch 9.3 Handover 9.4 Summary 10 Work Stage 7: Maintenance. 10.1 The Project Manager's Input 10.2 Who Should Form the Maintenance Team 10.3 How the Site Should Be Maintained 10.4 Service-Level Agreements 10.4.1 Content of the SLA 10.4.2 Tasks for Client's Internal Update Team 10.4.3 Ongoing Tasks for Web Development Team 10.4.4 Commitments to Meetings 10.4.5 Site Access Control 10.4.6 Termination Notice Periods 10.4.7 Training and Development 10.4.8 Response Times, Error Handling, and Resolution Procedures 10.4.9 Data Storage and Site Recovery 10.4.10 Data Ownership and Use 10.4.11 Project Documentation 10.4.12 Performance Monitoring/Management Reporting 10.4.13 Liaison with Third Parties 10.4.14 Software and Hardware Upgrades 10.4.15 Maintenance Team 10.4.16 Costs 10.5 Summary 11 Work Stage 8: Review and Evaluation. 11.1 How the Project Manager Contributes 11.2 The Project Review 11.3 The Value of Evaluation 11.3.1 Measuring ROI 11.3.2 Increasing ROI 11.3.3 Decision Support 11.3.4 Performing to Standards 11.4 Quantitative Metrics and Analysis 11.5 Qualitative Metrics and Analysis 11.6 Summary Case Study: 12 Reality Bytes. 12.1 Project Background and Overview: www.channel5.co.uk 12.1.1 Project Clarification 12.1.2 Solution Definition 12.1.3 Project Specification 12.1.4 Content 12.1.5 Design and Construction 12.1.6 Testing, Launch, and Handover 12.1.7 Maintenance 12.1.8 Review and Evaluation 12.2 Summary Appendix A Resources. Appendix B Recommended Reading. Index. Ashley Friedlein is cofounder and CEO of e-consultancy (www.e-consultancy.com), an online and offline service for U.K. e-business professionals, providing access to the best e-business information and advice. Previously, he was lead strategist and senior producer at Wheel, where he successfully managed the development, delivery, and ongoing maintenance of several major Internet sites, in particular those for media owners. Ashley comes from a background in digital media production, having worked at Pearson and Bloomberg and with the major U.K. broadcasters. He is the author of Web Project Management: Delivering Successful Commercial Web Sites (2001).